Config Server Firewall (CSF) is a Stateful Packet Inspection (SPI) firewall, Login/Intrusion Detection and Security application for Linux servers. It's is a security tool that can protect your server against attacks, such as brute force, and improve server security. Install CSF: Log into your server as root, using SSH. You will see "Installation Completed". 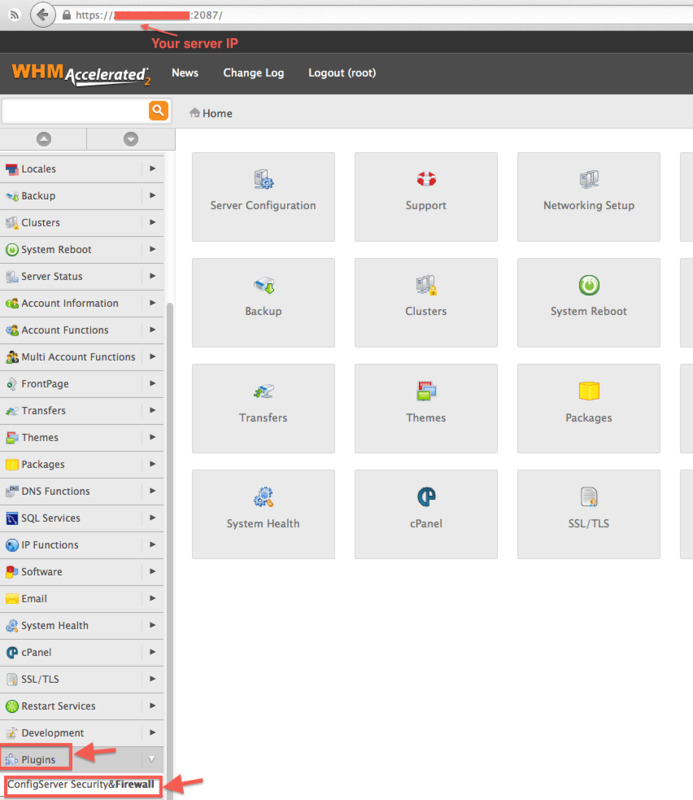 Configure CSF: Login to your server via WHM as root and go to the bottom left menu. In the Plugins section, go to ConfigServer Security Firewall. Then, in the "csf - ConfigServer Firewall" section (on the right panel), click on "Firewall Configuration". If you have changed your SSH port number, you need to add this new port on the "IPv4 Port Settings" and/or "IPv6 Port Settings". 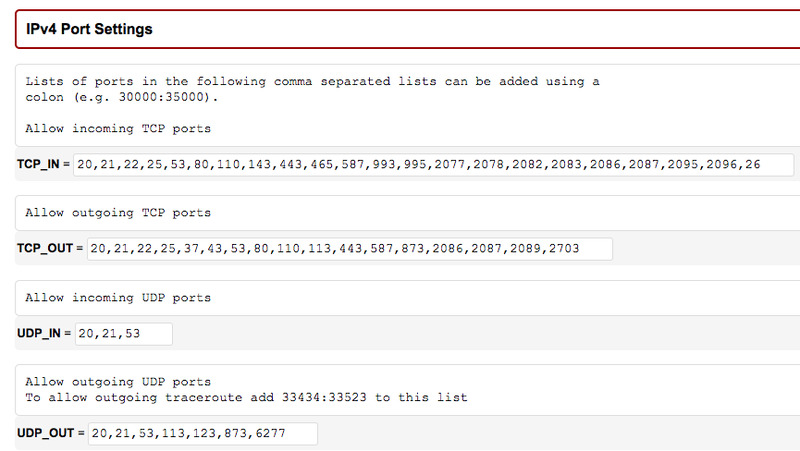 You can also use this section to add a specific port for an new application installed on the server. If you are using R1soft/Idera external backup solution, you need to allow inbound traffic for TCP port 1167 in the port TCP_IN section. -- Set "SYSLOG_CHECK" to "1800"
-- Set "PT_DELETED" to "1"
-- Set "PT_ALL_USERS" to "1"
CSF can help you to secure spam abuse vector and detect suspicious email activities. -- Set "SMTP_BLOCK" to "1" in "SMTP Settings" section. -- Set "LF_SCRIPT_LIMIT" to "250" to identify scripts sending out 250 emails messages in an hour. -- Set "LF_SCRIPT_ALERT" to "1" to send an email alert to the system administrator when the limit configured above is reached. You can save the configuration by clicking the "Change" button at the end of the page. Then restart csf/lfd service. Thereafter, go back in the ConfigServer Security Firewall main page. On the top of this page, you should see "Firewall Status: Enabled but in Test Mode" If you see "Firewall Status: Disabled and Stopped" please click on "Enable". Confirm the configuration and remove the "Testing mode". Save this modification by clicking the "Change" button at the end of the page and restart csf/lfd service. You can monitor the firewall activity by clicking the "Watch system Logs" button on the ConfigServer Security Firewall main page. 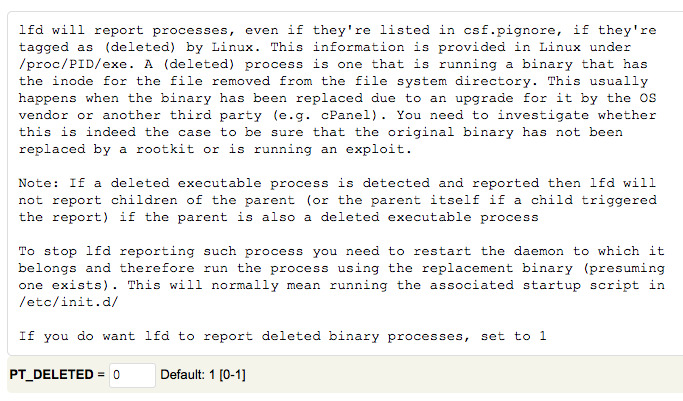 Or read the log file /var/log/lfd.log which is accessible via SSH.